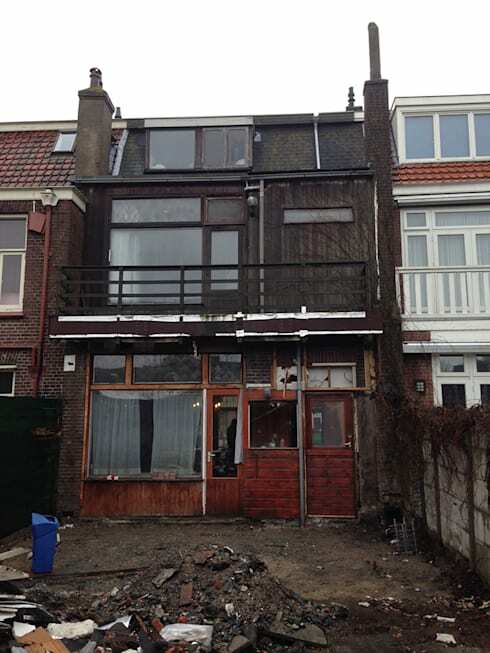 Before architecture firm Puurbowen took on the challenge of restoring this run-down slum of a townhouse, it was the eyesore of the block. Transforming what looked like a fire-damaged squat into a fresh, modern and inspiring home was surely a feat. The result is a home with warmth and personality that is now likely the envy of its neighbours. 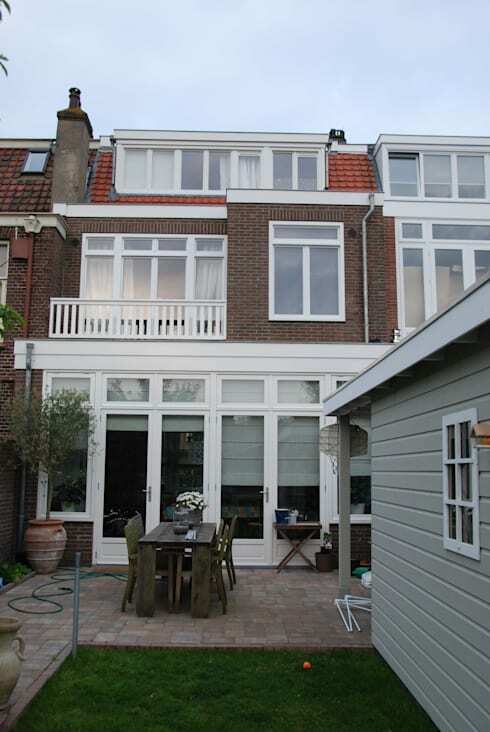 Hopefully this before-and-after restoration of a house in the Dutch city of Haarlem will give you inspiration when it comes your own home – a few changes here and there can completely transform it! The garden is also in a terrible state, with sand and junk all over the show. Dead plants line the walls while the general look and feel is a very depressing one. Yet, when we see the next door homes, we see how much potential there is! The facade was completely revamped, where the designers have introduced white plaster and a stone element. These complement the use of glass throughout, which opens the home up onto the garden. The garden was also landscaped – it is now very stylish and very functional. The designers created a terrace space where the family can enjoy the fresh air and the sunshine. They've opted for durable wooden terrace furniture, which will survive in all weather conditions outside. This is a great tip for any outdoor area! You want your furniture to look great but also last a long time – wood is a wonderful option. The designers also utilized the outdoor space for some grass, flowers and pot plants, adding a touch of greenery to the home. If we head inside the home, we can see that the designers opted for a more Scandinavian look and feel with light wooden floors and white walls. This creates a very clean, chic and minimalist look that still allows for wonderful homely touches. 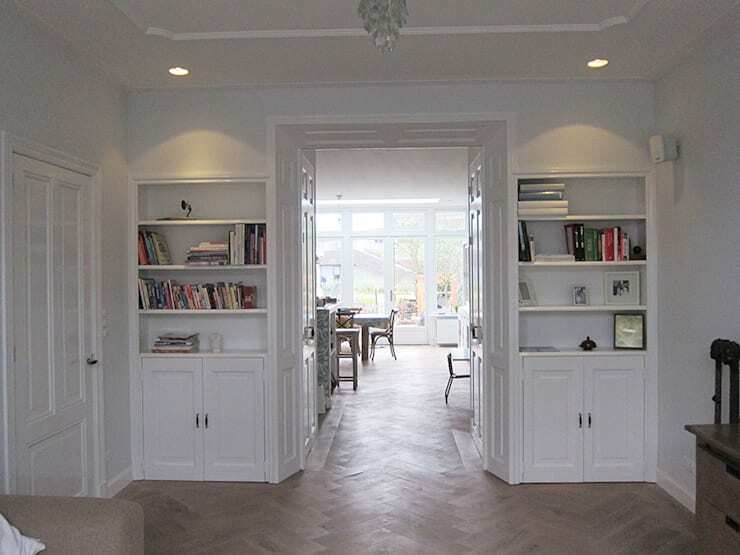 In this image, we can see how the rooms open up onto one another, creating a lovely flow between the interior spaces. The home isn't overtly large, but it looks spacious thanks to the design. The use of smart storage solutions also contributes to the impression of space and size. In this area, we can see two sets of shelves as well as cupboards. These allow all personal items to be stored neatly away, without taking up any floor space. In the kitchen, the designers have added some homely touches that truly make this space the heart of the home. 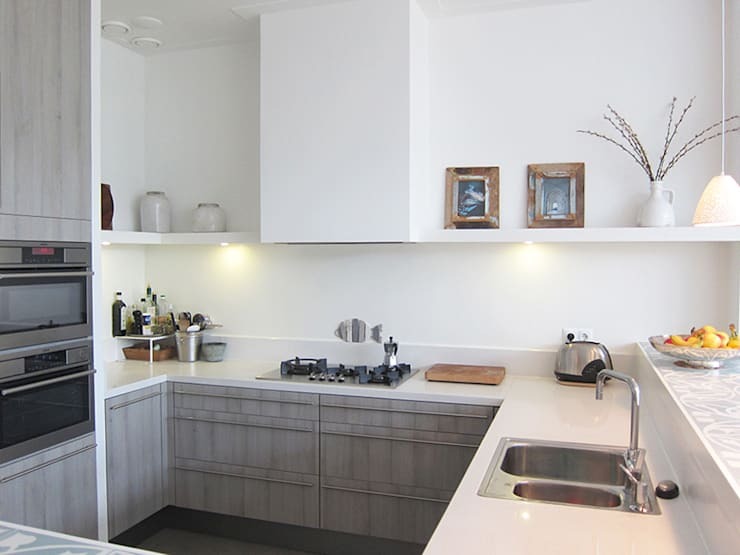 They've gone for white counter tops and walls, which work in harmony with the wooden cupboards and drawers. A picture frame here or there reminds us that is someone's home, adding warmth, personality and charm. You'll notice that only the most necessary items are out on the counters, however. With limited space, the designers haven't wanted to clutter this area with cutlery, crockery and glassware. They've managed to achieve this by investing in smart storage solutions throughout the kitchen space – just like we've seen in other parts of the home. Have a look at these other really clever storage solutions for small homes. The dining room opens up onto the garden area, thanks to the large glass windows and doors. This creates a stunning visual effect! The dining room is framed by the beauty of the exterior. This also allows for lots of natural light to flow into the home, opening it up. 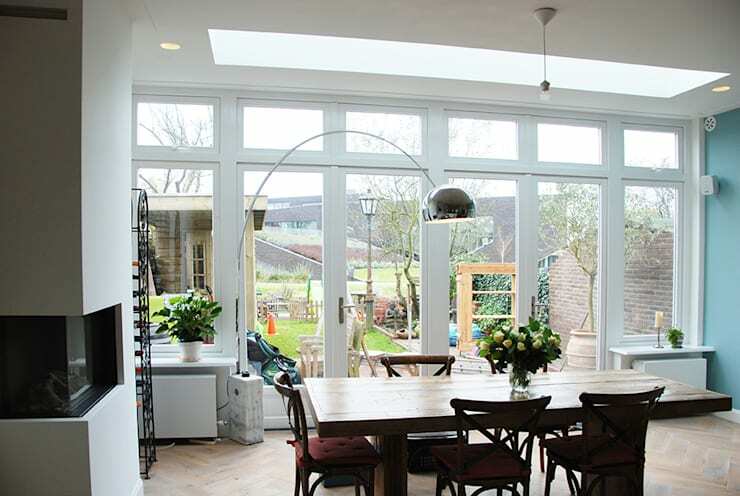 Sunlight and ventilation are key for any modern home. In this space, you'll notice the simple yet sophisticated design and decor. The large dining room and sleek lamp are some of the only furniture in this space. However vases of flowers naturally enhance the room – a good design tip for any area in the house! The staircase is a functional feature in the home, but we can see during the revamp that it has also become the protagonist too. You are bound to notice its gorgeous design if you walk through this space. When you have limited room to work with, you want your functional items to double up as design elements. 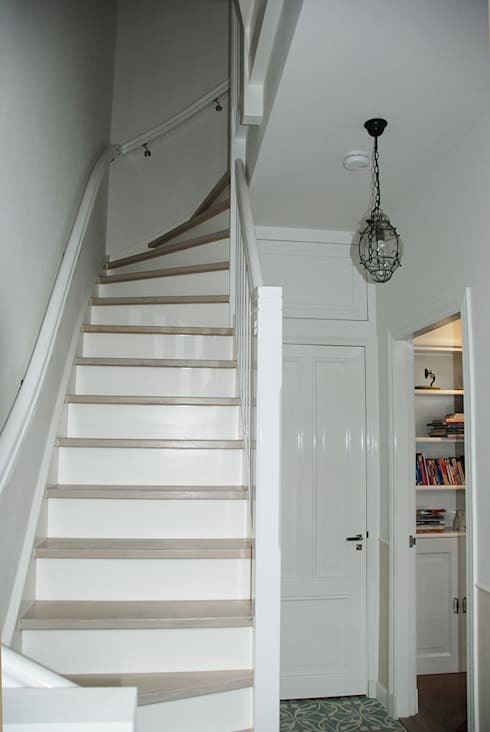 If you're renovating your home or want to add something unique charm to it, speak to an architect professional about how you can use your staircase to enhance the entire home. In this case, the white stairs curve up towards the second floor, adding sharp geometric angles to visual height. If we head into the kid's bedroom, we can see how the designers have not held back when it comes to ensuring that there is warmth and charm throughout the home. In this room, they've added patterned wallpaper to the walls, which brings in a design of plants and birds. This also brings in some different red, pink and purple tones. A bedroom should always have a touch of colour to cheer you up! This works very well with the neutral furniture. It also means that in future, the residents just have to replace the wallpaper if their child grows out of this design. This renovation has resulted in a beautiful family home that is warm, charming and functional.